performance, energy efficient dust collector that they design. The Endeavour Foundation which manufactures timber surveyor pegs for the mining industry saw this potential and commissioned Australian Dust Control to design, manufacture and install a Shaker Dust Collector for their expanding facility at Home Hill in Queensland. 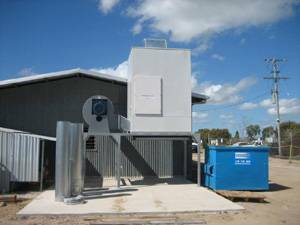 Australian Dust Control designed a Shaker Dust Collector with a 30kw fan to replace their existing mobile dust collector system which was now inadequate for their new requirements. Australian Dust Control was able to give them one central Shaker Dust Collector system where the waste is discharged into a 3 cubic metre waste bin. This Shaker Dust Collector has helped to improve their filtration and waste disposal significantly. This is another happy customer for Australian Dust Control.